It’s been several months since I’ve written anything here, during which time I have sadly had to say good-bye to my sister. Nothing awakens us more than experiencing the departure of a loved one – particularly in the prime of their life and career, as was she. Nothing stops us wondering why – someone who was so loved and valued by so many, is removed from the physical world where they made such a positive impact. But our grieving must be brief as we remind ourselves of the gifts and opportunities of that relationship, both given and received; the good times and the bad. We move forward now, knowing that our meeting and our separation is just one more part of the intriguing jigsaw of life and our own journey; a journey that eventually separates us all – merely by an illusionary mist. Enjoying my weekly sing with our wonderful ‘up beat’ ladies choir, I posed a question to one of its members – the response to which has prompted this month’s blog. With the common goal of making a good sound and just enjoying ourselves, this group of individuals – diverse in age and occupation, shares a camaraderie that can be felt as soon as you enter the room. A break for a coffee is a time to get to know people better and a time when I asked a younger member if she was also a teacher, as several others around us. “Oh no – I’m just a mother,” she said, almost apologetically. It was not the first time I have heard this response from a women who was staying at home to nurture her offspring. Although this mother was quick to show off her delightful children, as she proudly searched her cell phone for their pictures, I couldn’t help thinking that she somehow needed my approval to do so. What has society done to make women feel they are almost insignificant citizens when they choose the most challenging, tiring but fulfilling and natural roles – to be a full time mother to their offspring? Isn’t it time that we cherished the people who, as teachers in their own right – determine the society of tomorrow? Don’t miss this precious moment – it won’t come again. Speaking about her current change of good fortune, someone close to me made a profound observation of life. She said that it was regretful that we are unable to enjoy our lives during the bad times whilst waiting for the better days to arrive. She was right. When I recall my last months in France as I so urgently awaited a buyer for my house, I realize now how the anticipation and uncertainty distracted me from fully enjoying a very precious time; a time that I will never retrieve to experience again. Consciousness is probably one of the most used words in our language at the moment. But what does this word really mean? It seems that many of us have a different understanding of consciousness but my own perception of it is simply – being awake. If we are truly awake we are also aware. We are not only aware of our own actions and their effects on others, we are totally connected to what we are doing and experiencing now – in this very moment. Being fully conscious prevents us from regretting our past mistakes or holding on to the past rather than embracing the present. When we embrace the moment we are in, we don’t have time to fear the future because we quickly start to appreciate that ‘this moment’ is all there ever will be. Yes, anxiously awaiting the responses of my many house viewers, I did sometimes experience (something I thought I’d learnt to handle), the see-saw effects of anticipation and gloom – as I began to wonder if I would ever sell. In my own stillness however, I was reminded frequently that it was out of my hands now and to enjoy just being where I was at the time. But my ego just had to have its say – always frightened of being ousted or demoted. Egos feel uncomfortable in stillness and peace – almost like the jack-in-the-box that won’t go to sleep. So now I can see the whole picture. My house was bought by the most unlikely people at the most perfect timing on both my journey and theirs. It was perfectly designed in every detail, not by chance but by an all knowing power that constantly tries to guide us on our destined path – if we will only quieten our mind for long enough to receive. Having faced the unfriendly elements to walk my (very unwilling) dog, I was pleased to have her approval to retreat home for a cup of tea. This event however, was slow to materialize when I realized the kettle was reluctant to boil. Half an hour later I was lighting candles and just waking up to the fact that there was no heating and I was getting cold. So many folk have been in this situation in the UK – many, wading in water with no electricity for weeks; many yearning to feel warm, safe and dry again. When we share common tragedy, joy or sadness we receive with our hearts and we speak with our hearts. We experience for a while at least – that which we are, in its purest form – within the unity of all. Over the years in my various roles as nurse, teacher, councillor and spiritual healer, I’ve had the great honour to meet and help many people. It’s a wonderful feeling knowing that you have been instrumental in helping to relieve another’s pain and suffering, but to be invited to share even the smallest part of another’s spiritual journey – is indeed, an honour and something that has enriched my own journey. It is a spiritual journey that mankind is on, each and every one of us. But strangely, we rarely recognize that truth as life tests us repeatedly – with what we first perceive to be ‘the great injustices’ of life. It is only when we are hanging on with our fingernails whilst we dangle over the precipice below that we come face to face with our truth – the very nature of our own being and the very nature of our own suffering. How very sad it is that so many of us resist the most precious lesson that life can offer us – until it is almost too late. Wouldn’t it be better if we could wake up earlier in the day of our life and have the rest of it to enjoy the splendours that it has to offer? When we awaken, our children will know that it’s time to open their eyes too and they will follow us as we walk out into the sunshine. We cannot escape the ebb and flow that is life but both its ebb and its flow cradles the wisdom that makes our journey a beautiful and worthwhile endeavour. 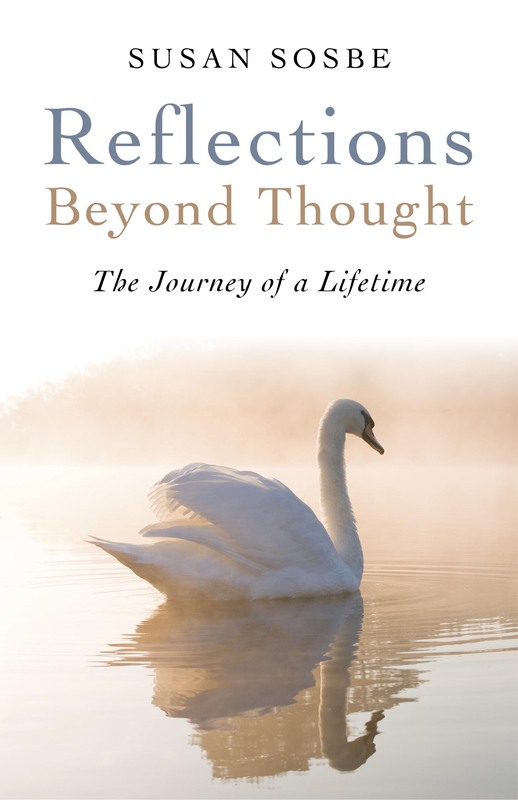 In my book “ Reflections – Beyond Thought” I share with you some of my journey in the hopes that it will inspire and bring hope when you are trying to make sense of your own or indeed, seeking new avenues to explore. I hope that you will read and enjoy it. This is the first post of this blog and I look forward to you joining me again when I share new thoughts and new reflections every month. Available from www.amazon.co.uk; www.amazon.com ; Foyles Book Shops and all good book shops.